FREE Figurative Language in Poetry - Use this Scavenger Hunt to find figurative language while reading poetry! This is a simple hands-on activity to use with students to get them to recognize figurative and sensory language in poems. Students have to find examples of sensory and figurative language such as idioms, personification, hyperbole, metaphors, similes, onomatopoeia, alliteration, consonance, assonance, and rhyme. Students can work individually or in groups. You can make the activity a grade or make it a game with the winners getting the highest number of points. Includes teacher directions, student assignment sheet, and student recording sheet. Poems not included. Pull a variety of poetry books from the media center and allow students to search through the various texts. I take my students to the media center and have them work in groups, looking at books stacked on their tables. 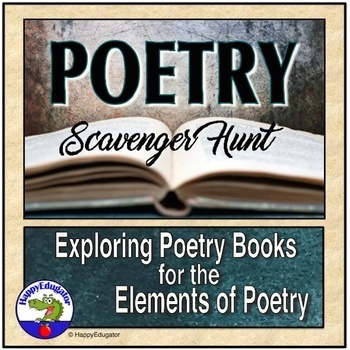 No doubt some of your kids will get hooked on poetry after reading the variety of poems in this activity. Enjoy the freebie! How to get TPT credit to use on future purchases: Provide Feedback Give a quick rating and leave a short comment for the product.